Whether you are a seasoned pro or a beginner, it is important to know what you are looking for when making a wood lathe purchase. I have spent hours researching to find the best lathe models for intricate and fine woodworking so you don’t have to. Please consider sharing this with others! You can help others can benefit from this research also! Many DIYers and woodwork professionals find themselves with a need to complete intricate types of work; for instance, spindles, decorative elements, and smaller pieces of work. A large wood lathe is not going to be the best option for this type of work, and a cheaper option is not likely to have the right ability to do the work to the right degree. For that reason, it is worth spending a little more on a wood lathe for intricate and fine woodwork. Checking out reviews is the single way to find out whether a particular model of lathe is ideal for that type of requirement, and because you are going to be spending more money, you need to get a really honest overview before making a final decision. We know that there are different types and sizes of wood lathe on the market, but the types which are best for this kind of intricate work include the pen lathe and a mini lathe. This is because these types of lathes are smaller, and therefore allow you to really get into the project and control the outcome. A pen lathe allows you to not only turn the wood but to design small details into the wood using a pen tool. On the flipside, a mini lathe is a smaller option, which allows you to easily make curved types of wood designs and spindles. As you turn the wood you can ensure the design is created, and both of these types of lathe are easy to store, and can be moved around without much hassle or stress. 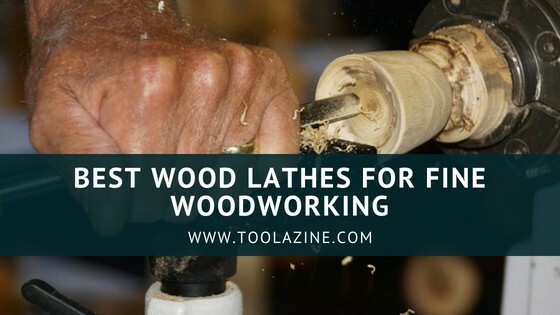 I am assuming you already know something about wood lathes (if not check out this review about the best wood lathes for the money & buyer’s guide), and you are looking to make finer and more intricate designs. If you are looking to buy a wood lathe and have a set budget in mind check out my review of wood lathes on a budget under $300, $500, $1000, $1500 & $2000 dollars. Many of these products are multi-functional, e.g. you can create standard woodturning designs on them, but they have the ability to allow you to create spindles, curves, and fine designs, either with an attachment or via a different method of use or technique. This particular lathe is ideal for those on a budget in one respect, but its small size makes it suitable for intricate types of turning too. The lathe can easily be transported to other places, because of its size and lightweight nature, whilst making for easy storage too. The speed is adjustable, which creates more control over wood working, and there is a 5” faceplate for creating items such as bowls and cups. You are dealing with a big name brand here too, which of course means that you can have confidence in your purchase. You can easily work with pieces of wood which are anywhere from 12” length to 8” width, and the lathe also includes an MT1 spindle and tailstock taper which helps you to create finer items and details when carrying out your professional or hobby-related work. The motor is quiet and strong, and it has a soft start in nature, so it creates a safer environment. This is ideal for intermediate users who are starting to learn the basics of finer woodworking pieces and don’t have the extreme know-how of a professional yet. This motor type of this model is also long-lasting. Why choose this particular wood lathe? The price is a major factor in deciding whether to go for this lathe or a different one, as well as the easy transportation and storage. The lathe is ideal for the finer type of woodwork that we are aiming to achieve here, because of its small size, it’s variable speed, and the MT1 spindle and tailor stock taper, which helps to create those fine and intricate designs. Check the latest price of the WEN 3420 8″ to 12″ Variable Speed Benchtop Wood Lathe on Amazon. This wood lathe is ideal for those finer details, but it is also a mid-priced option, which makes it more accessible for intermediate users, as well as professionals. The fact that this model has several features for finer designs also makes it ideal for the cause, as well as being from a big brand name yet again. This branding really does give confidence when spending a considerable amount of money. Again, this is a benchtop type of router, so you can easily move it around and store it when not in use. More seasoned users will probably find they need to purchase another router for big projects, but the fact this one can be moved out of the way means it can be used whenever it is needed. The motor is strong and powerful, at half horsepower, and is single phase meaning low maintance and reliability. In terms of speed, this particular router has pre-sets and you can choose from 826, 1205, 1713, 2422, 3337 rpm, so there is a large scope and range for control of speed. The router includes a tool rest within the set, as well as a live rolling centre, spur centre and wrenches too, so you really do get everything you need within your purchase. The tailstock travel distance is also 31/4” which means it is ideal for those finer details you need to create. The price is another good indicator, but everything you need is included in the purchase, such as wrenches and other accessory packs. The router is also super easy to move around and you can easily pack it away when you are doing regular wood turning tasks, on a larger machine perhaps. The fact the speed choice is not adjustable but is instead pre-set is not a massive problem, because this does allow you to choose a speed that suits the job you’re doing e.g. slower for more intricate work, and there are several pre-sets to choose from also. Check the latest price of the Grizzly H8259 Benchtop Wood Lathe 10″ on Amazon. The quality of Powermatic products really speaks for itself and although you are certainly going to need to spend money to obtain it, if you are a professional or an intermediate who is working up to professional levels, then this is certainly worth the investment. This lathe is a large option, which is not going to be easy to move, but the plus point is that it isn’t just perfect for intricate designs, but all types of work too, so when you have it where you want to use it, you shouldn’t have to move it too much anyway. There is a lot of control over your work with this lathe, as it has digital RPM capacity, which you can read out for yourself and decide whether you want to increase the speed or decrease it, depending on the work you are doing. The speed range is also very accurate, so even moving a tiny amount will give you benefit. The sliding headstock is steady and easy to move, whilst giving you even more control over what you are doing. There is a spindle lock and built-in spindle indexing as standard placed on the headstock, so you can easily drill in patterns or features, including routing flutes. Basically, creating finer designs and intricate work whilst turning your wood on this machine is much easier than some other cheaper models. Whilst we did mention that the high price makes it more suited for professionals, it is also a good option for intermediates who are learning. This is because you can get accurate results, without having to try super-hard to control your turning. The tool rest has also been improved and redesigned to allow increased chisel movement along the tool rest, without bumps or excessive movement. The laser etched quill is also self-ejecting and there is a tool caddy attached to the lathe, for easy storage of your other tools. The huge number of features and ease of use is a major plus point, and whilst the price might be off-putting, for those who are serious about creating intricate designs and finer options, it is a must have as part of your tool collection. The size of the lathe isn’t huge, but it is heavy, so it’s not the best idea to try and move it around too much. If you can install it in your work station in a place you don’t intend to keep moving around, then you will be set for all the wood turning endeavors you need to complete. Check the latest price and buy the Powermatic PM2020 2HP 1/3 Ph 30 Shortbed Lathe on Amazon. Whilst this wood lathe is not as expensive as the Powermatic option, it is still pricey overall. Whilst that is a downside, the quality you are getting in return is very high, and the ability to create intricate and fine wood turning projects is superior to many other lathes too. The speed range on this particular lathe is also digitally controlled, e.g. you can adjust it to whatever you want, without having to rely on pre-sets, and that in itself is a plus point for fine work. The range goes from 15 to a maximum of 3500rpm, so there is plenty for space for manoeuvre within it. The motor is also super powerful, at 2 HP and 220 volts. The lathe features a spring loaded spindle lock, and has an outboard swing maximum amount of 32”, so there is a lot of room for manoeuvre and control. Here is a three phase output drive belt and a self ejecting floor to spindle centre, which makes for ease of use. Whilst this particular lathe might not be from an instantly recognisable brand name, unlike the Powermatic option, it does pack a very powerful punch, and is a great option for intermediate users who are attempting to become much more au fait with intricate, fine wood working projects. Those who want superior quality, but don’t want to pay the extreme high prices should be looking towards this option. Whilst the price is still high, it isn’t the highest choice, and the quality is superior to many other lathes around. There is a very large speed range to choose from, which is digitally controlled by you, and you don’t have to rely upon pre-sets to control your work. This is another lathe which is large and heavy, so it isn’t ideal for moving around too often. Having said that, it does work on large projects easily, as well as the finer, more intricate choices, so once you have made a purchase, you’re unlikely to have to duplicate with lathes. Check the latest price and buy the Laguna Tools MLAREO 1836 Revo Lathe on Amazon. Our final choice for the best wood lathes for fine and intricate work is a middle of the road price ranged product. It is one which is ideal for those who are learning their trade or hobby. With a strong and powerful 2 HP motor, which runs at 110V on single phase power, this is a machine, which is very durable and will certainly last the test of time. This is a benchtop lathe that is strong and sturdy, with cast iron legs and cast iron bed too – this lathe is designed to stay put and to minimise any vibrations that occur. There are 10 speed pre-sets, which run from 600 to 2400 rpm choices, and within that the increments offer a large degree of choice to allow you to keep control over finer types of wood turning and designs. It has a quick lock and release lever on the tailstock and headstock and each rotate 180 degrees in four increments. The Shop Fox 1758 Wood Lathe comes with a 6” faceplate, a MT2 spur centre, a MT2 live centre and a tool rest which also features a swivel base on the arm. All of this adds up to easy use and control over your work, and allows intermediate users to learn without having to struggle with a difficult to use lathe. The price is pleasing and for those who are learning and building up to professional levels, this benchtop wood lathe is a great choice. The speed choices are pre-set, but here are 10 of them, so they aren’t too restrictive. The lathe is also very sturdy, made with cast iron, and isn’t going to move around whilst you are using it. Despite the iron material, it is movable if you want to put it away for storage from time to time, when not in use. Check the latest price and buy the Shop Fox 1758 Wood Lathe with Cast Iron Legs and Digital Readout on Amazon. These five lathes are ideal for not only intermediates but professionals to. Whilst the Powermatic and similarly priced product are great for those who already have the necessary skills and knowhow, the others are perfect for intermediates or learners, who want to build up to higher skillsets with intricate pieces. Many of these lathes are benchtop in type, so they are a little smaller than some of the bigger lathes on the market. This is necessary for the fine wood turning that is required for this type of work, but a few of them do double up as multi-purpose options besides. When making your choice consider what you are going to be using it for, how often, and your skill and ability level too.